This week, we kicked off our podcast by doing a Q and A with questions submitted by our fantastic fans! Then we interviewed MBUS Promotion and Publicity phenom Alyssa DeHayes about her class, the music industry and her favorite concert memories. All you need to do next is listen! Check out the "Click for Podcast"
This week we interviewed our Music Business Director David Barbe about the ever-evolving Athens music scene. David is a jack of all trades and has done it all in regards to the music industry. We hope you guys enjoy listening to his stories as much as we did! Yo Jammers! It's our second episode, and this week we are highlighting some of the people in the music business program who are dropping new singles! Listen in by tapping that "Click for Podcast" button and check out all of their websites/content featured below. As always keep liking us on Facebook and looking out for updates on what we have going on each week! Also follow us on SoundCloud ayee. Happy jamming! Welcome to Peach Jam! 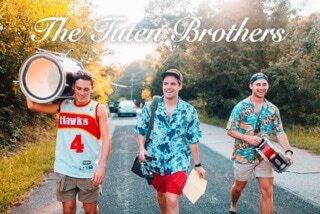 Our pilot episode features the Tuten Brothers, a country-rock group from Roswell, GA including brothers Walker and Sam Tuten and their longtime friend Connor McAdams. The group has developed a large local following and has successfully played venues in both Athens and Atlanta. Don't miss their next show this Thursday 3/16 at the Georgia Theatre and check out their website posted below. Tune in weekly to keep up with the artists you love in Athens and see what new segments/content we bring to Peach Jam. Bear with us as we work on our performing voices and get out all the editing kinks in the next few episodes. Leave us a comment or contact us through our drop box if you are interested in being featured or have suggestions for content. Keep jammin. We are four UGA Music Business students who are passionate about the local Athens music scene. We are hoping that our podcast series and blog posts shed some light on the talent and businesses within the Classic City.